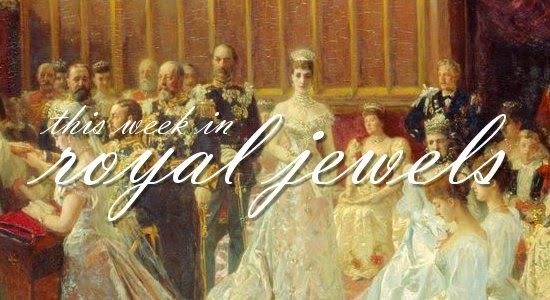 A bit of a casual week when it comes to royal jewels -- but there's also a definite trend happening in the earring department. Be sure to vote for your favorite in the poll below! 10. To kick things off, we're reaching back to an event we didn't cover last week: the visit of the grand ducal family of Luxembourg to the Vatican. All three of the grand ducal daughters-in-law were in attendance. 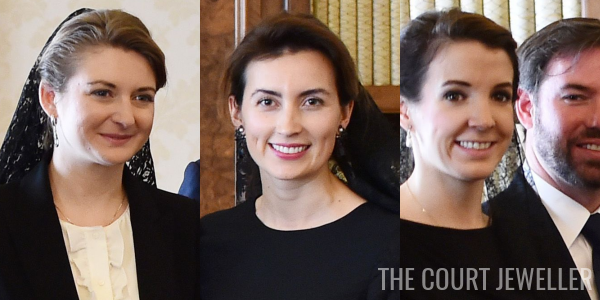 Hereditary Grand Duchess Stephanie wore a delicate pair of pendant earrings; Princess Claire donned an intriguing pair of stud earrings, and Princess Tessy selected a classic pair of pearl drop earrings. 9. 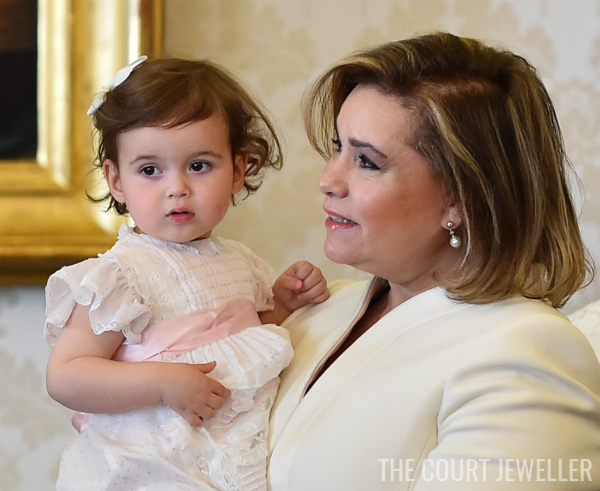 Grand Duchess Maria Teresa (holding her granddaughter, Princess Amalia) wore a pair of drop earrings with round pearls for the papal visit. Note that she's wearing white, while her daughters-in-law are wearing black; as the wife of a Catholic monarch, Maria Teresa has the right to exercise the privilege du blanc. 8. 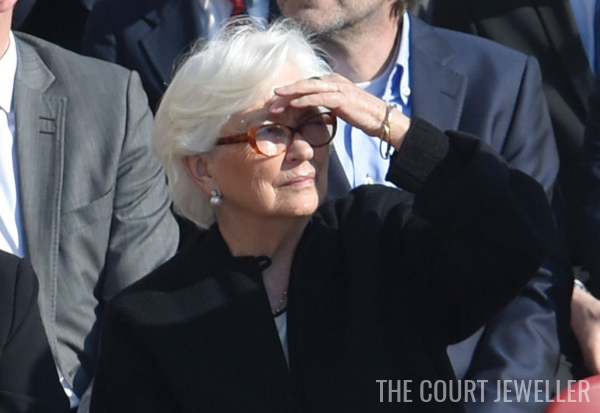 King Albert II and Queen Paola of Belgium were also in Vatican City this week. For an outdoor mass in St. Peter's Square on Easter Sunday, Paola wore a pair of diamond and pearl stud earrings, plus a delicate necklace and bracelets. 7. Prince Albert II and Princess Charlene of Monaco observed Good Friday at the Palais Princier; Charlene wore a delicate cross necklace and a pair of trendy back-to-front earrings. 6. Also in back-to-front earrings: the Countess of Wessex, who wore a pair on Easter Sunday at Windsor. 5, On the same day, Queen Rania of Jordan wore a pair of marbleized back-to-front earrings (reportedly from Dior) as she welcomed UN Secretary General Ban Ki-Moon to the Royal Palace in Amman. 4. For an Easter Sunday mass in Palma de Mallorca, Queen Letizia of Spain wore her unusual gold hoop earrings with interior filagree detail. 3. On Wednesday, Letizia chose her diamond sunburst earrings by Yanes for a microfinance event in Madrid. 2. 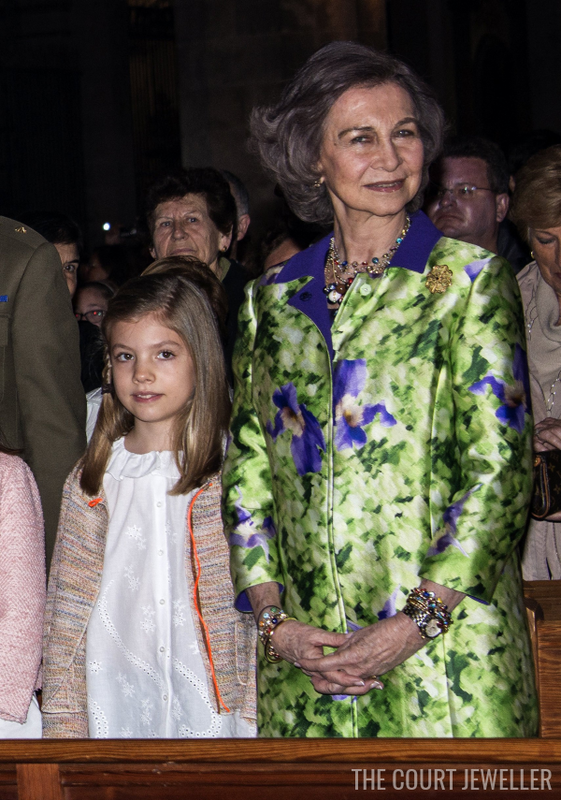 Queen Sofia of Spain loaded up the necklaces and bracelets for Easter mass, including her whimsical Easter egg necklace. 1. 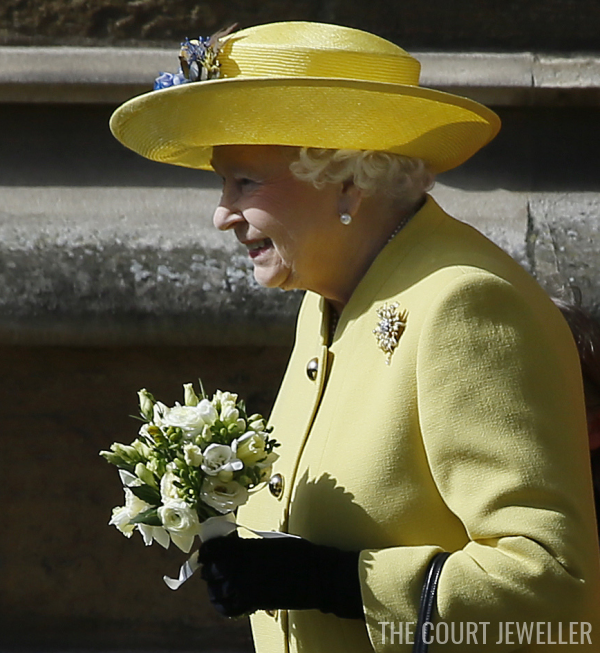 It was a wild and windy Easter morning at Windsor, but Queen Elizabeth II of the United Kingdom still glittered in one of her favorite pieces: the Frosted Sunflower Brooch. Note: I'm making a small change to the commenting policy here. Because links cause such a hassle with the spam filter on the Disqus system, I'm going to request that commenters no longer use links when posting comments here. I think that will streamline the system a bit. Thanks for your patience as I've tried to approve comments in the past -- hopefully this will make that faster!